Men Blazer Casual Outfit Styles. Clothes have been used by men for centuries to stand out among the crowd and fashion houses have helped this thinking a lot. Fashion is change and change is fashion. Trends are moving so fast that if you are not following these big fashion houses every second you will loose track of whats in and whats out. It has an influence on every ones life as clothing has become an important part of defining yourself and everyone has the freedom to choose whatever they wear, how they present themselves to the world. Men’s fashion with time has also evolved . Now the image of a man is not purely depicted as formal or macho but rather according to your class and culture and also a softer side has been added through fashion into men’s attire. 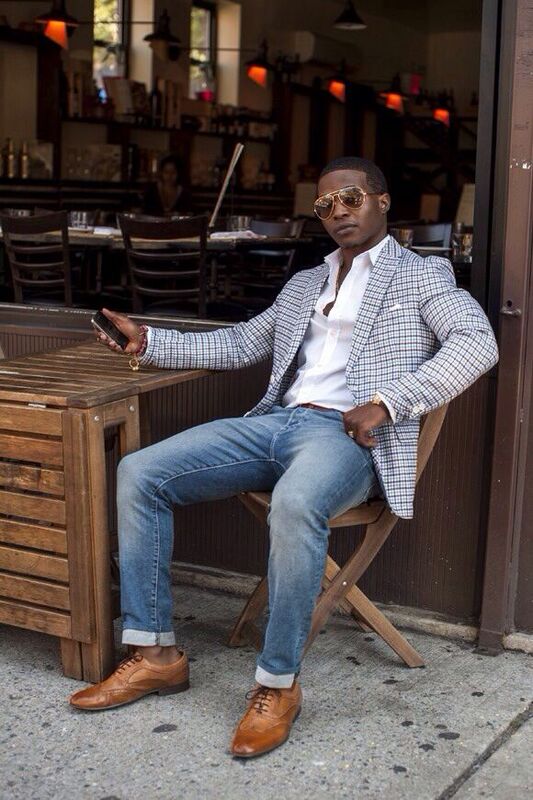 Casual wear has made its way into a man’s wardrobe and blazers are a force in casual outfits. They not only depict casual but if put together nicely with other clothing pieces they can be formal as well.That is why we have gathered a few ideas for you to dress effectively with blazers. Are you a nerd? This elbow patched blazer is fit for a college professor. A connoisseur of clothes? Velvet is the cloth for you. 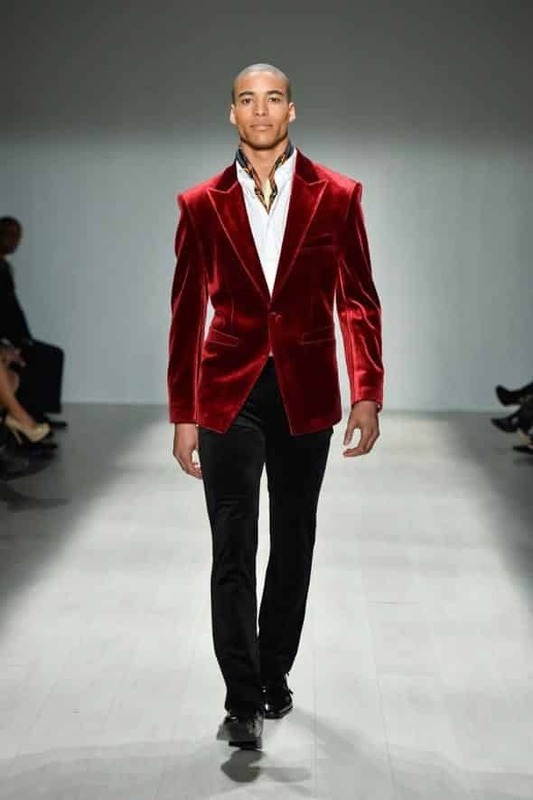 Red velvet blazer will give you an edge over every other male in the room. White is the color for the warm weather and to achieve a sophisticated look wear this white blazer with a white front button shirt with matching sneakers. Bosses today wear sandals to work. 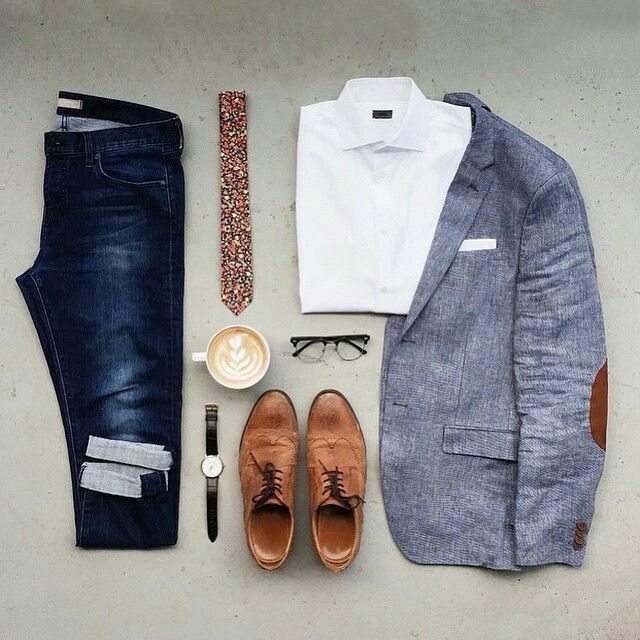 This outfit has been spiced up with a tie and loafers to go to your work. Dark gray slim fit trousers with a light toned palid blazer is all you need. If you like a softer image to portray; this is a perfect combination for you. Brown shoes are giving you the extra edge. Cropped or turned up pants are the trend this season. Another perfect outfit for the winters. Olive green is worn perfectly with a printed scarf and a gray high neck. Do remember to wear boot with this outfit. If you are a die hard formal outfit fan this is what we have picked for you. A neutral blazer with gray dress pants and oxfords; what more can a man want? A black blazer is a must have for every man. When it comes to fashion for men, i specially love blazers. They’re casual but still elegant and professional. I often wear them with polo t-shirts or shirts with jeans and a pair of leather shoes. They’re my favourite items for office time. Great post! Such a great post!